Halloween time is SUPER fun for kids! 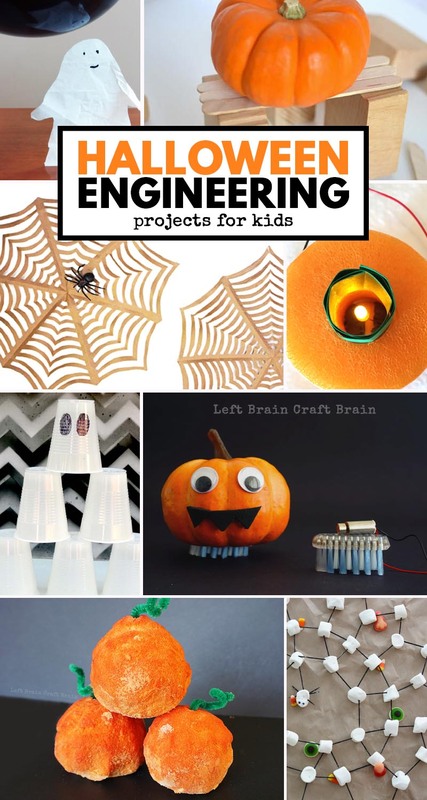 Theme your engineering projects this year with Halloween and keep your STEAM kids creating with these engaging ideas. 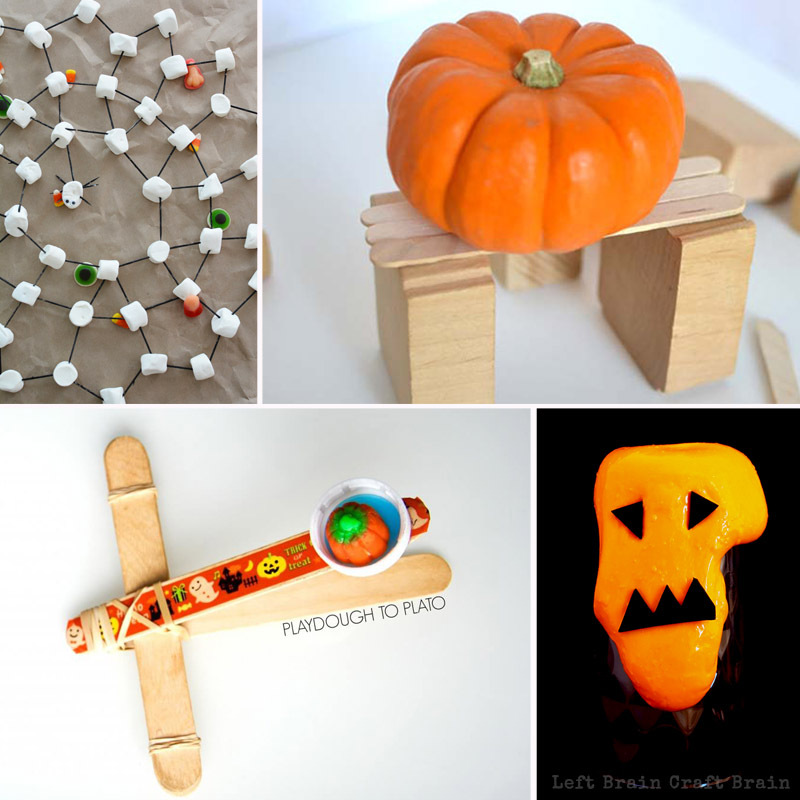 This set of Halloween engineering projects are perfect for your kids. They are going to dive into the depths of a pumpkin, build with bones, and create beautiful creations with all things STEAM! This post contains affiliate links. We may receive a small commission if you purchase a product via one of our links. This is at no cost to you. Get ready for some pumpkin-y, ghostly, candy corny engineering fun!! Pumpkin Brush Bots These little pumpkins are one of my favorite projects we’ve ever made. They’re a fun take on a traditional, must-do brush bot project and will make you smile every time you see them spin. Halloween Pumpkins with Squishy Circuits I’m completly in love with squishy circuits. They are a great learning tool for your STEAM kids and a great addition to your Halloween decore. All you will need are a couple extra pool noodles and a squishy circuit! It’s that easy. Ghost Stack Spooky STEM Challenge This is another fun spin on a traditional engineering challenge for kids. See how high and how fast they can make a ghost tower! Electric Magic Wand Harry Potter fans, get ready to celebrate. This awesome tutorial shows you how to make your very own, light-up magic wand. It’s an awesome electrical engineering project for kids, all year round, not just at Halloween. Giant Kirigami Spider Webs Paper engineering is one of the most affordable and fun ways to introduce kids to the transition from 2D to 3D. These GIANT spider webs make it really fun and are fabulous Halloween decor. Dancing Ghosts and Bats Have you ever tried to make a ghost dance? You can now! 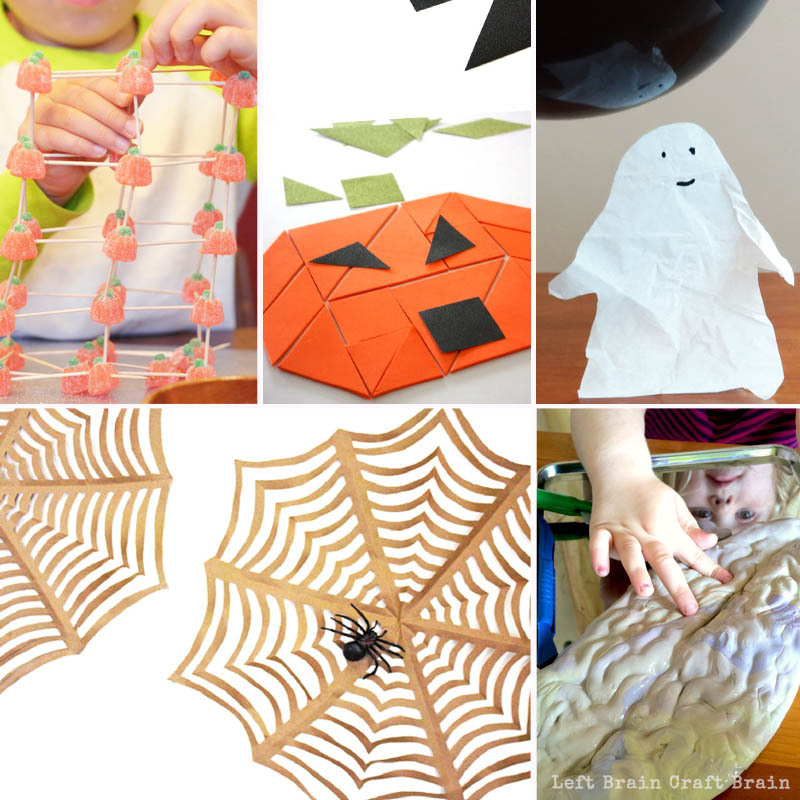 Grab a balloon and tissue paper for this fun Halloween themed engineering project. It will keep the kids entertained for hours! Building Structures with Candy Pumpkins We always have WAY to much candy around our house at Halloween time. Why not use your favorite candy pumpkins for your next engineering project? All you will need is a clear space, mini candy pumpkins, and some toothpicks! Halloween Tangram Math Activity Tangrams are one of my favorite learning tools for STEAM kids! This Halloween build your own spooky creations with tangrams and Halloween themed creations. Jack o’Lantern Slime In a past life I worked full time as a chemical engineer. There are SO many cool things you can create with chemical reactions. Like slime! The kids will love constructing gooey pumpkin faces with this slime activity. Pumpkin Catapults This one is going on the Halloween bucket list this year! All kids love catapults and this year you can create your own Halloween themed catapults to launch your little pumpkins across the room. Marshmallow and Toothpick Spider Web Spider webs are classic Halloween decor! Build your own with a couple materials you can find in your kitchen. 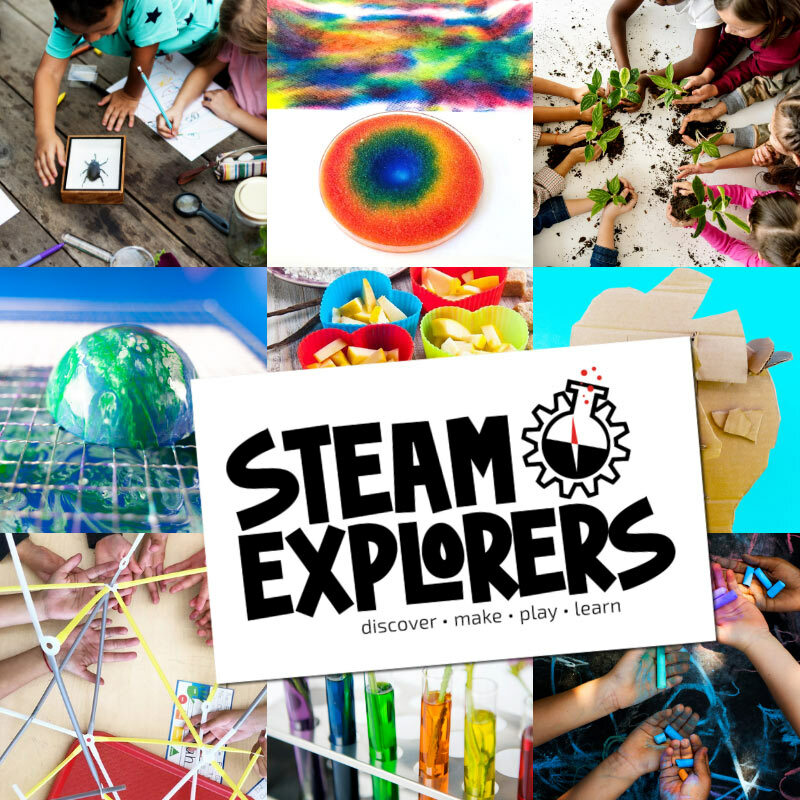 Challenge your STEAM kids to build their own webs this Halloween. Storytime STEAM with the 5 Little Pumpkins Add a building spin to a favorite Halloween book, Five Little Pumpkins. Fizzing Pumpkin Treasure Rocks For more chemical engineering fun, make these pumpkin treasure rocks with the kids. They’ll love reacting and finding the surprises hidden inside. Candy Corn STEM Activities I admit that I LOVE candy corn. I refuse to have any in the house knowing that I will eat a whole bag! BUT for the sake of science, I guess I could allow some to creep in for this inviting STEM building challenge. All you need is a bag of that delicious little candy corn and a box of toothpicks. The rest is up to the imagination of your child! 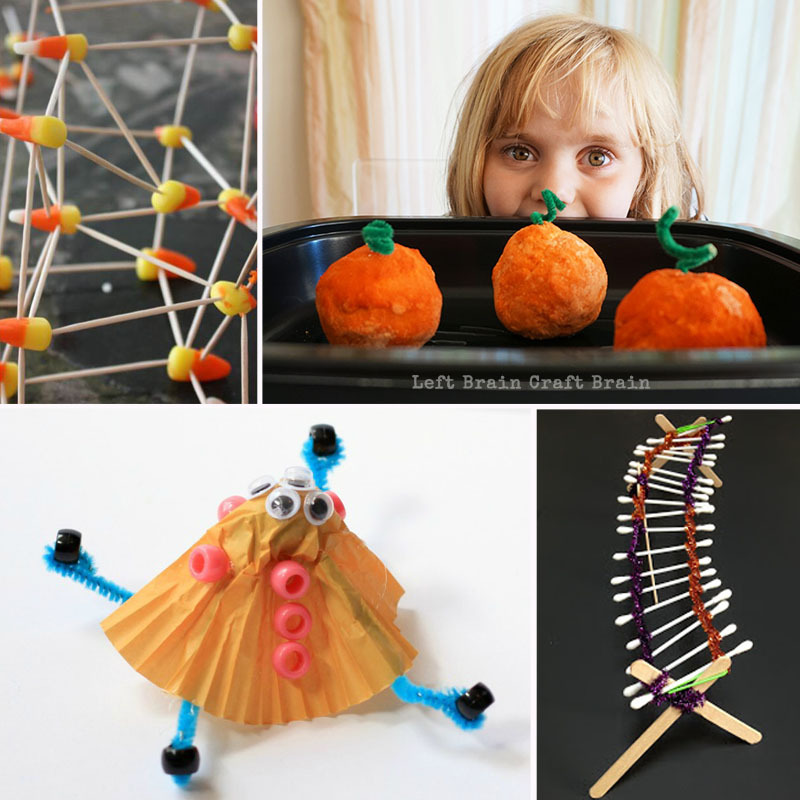 Halloween Engineering Activity: Building a Monster Monsters and Halloween just go together. Grab a couple materials from your craft stash and kitchen to make this invitation to create that will bring out giggles and creativity! Halloween STEM Challenge: Bone Bridge Build a bridge of bones this Halloween! This challenge is sure to excite your creators. All you need is a box of Q-Tips, craft sticks, and a binding materials like pipe cleaners. Ask your kids to make a bridge that can hold weight or see who can make the longest bridge without touching the ground. 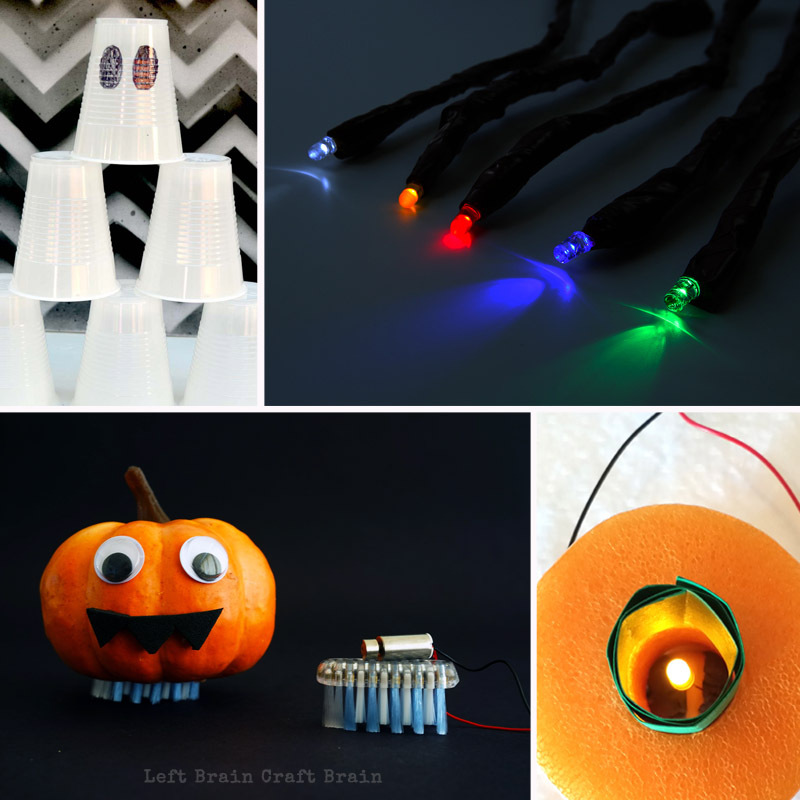 This Halloween will the the most educational yet with these Halloween Engineering Projects on your creation list! What are your plans for Halloween engineering fun? Like to integrate other topics into your engineering? 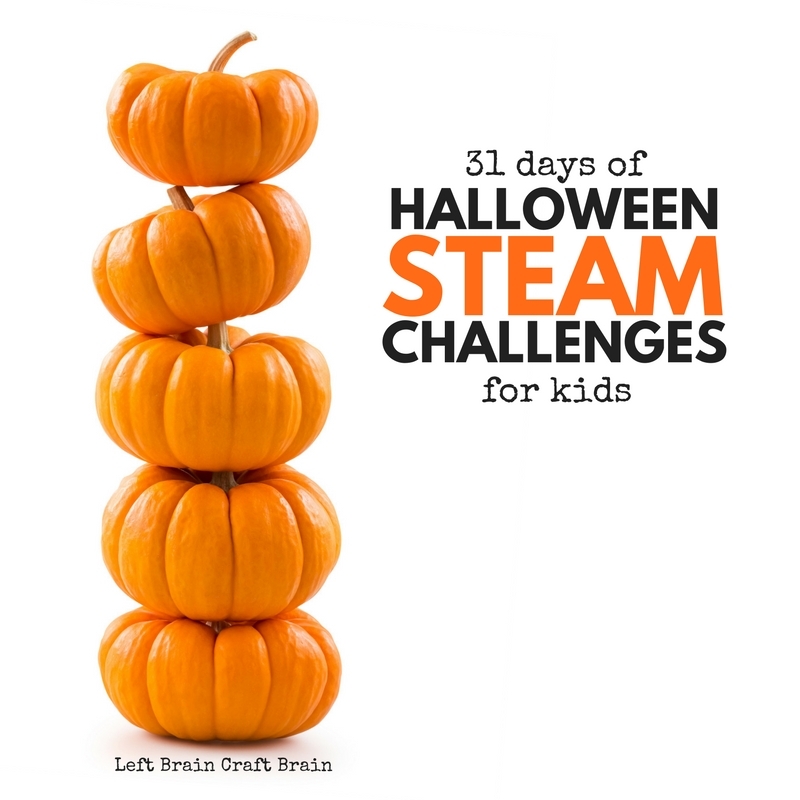 Try these 31 Days of Halloween STEAM Challenges! Download the cards HERE. 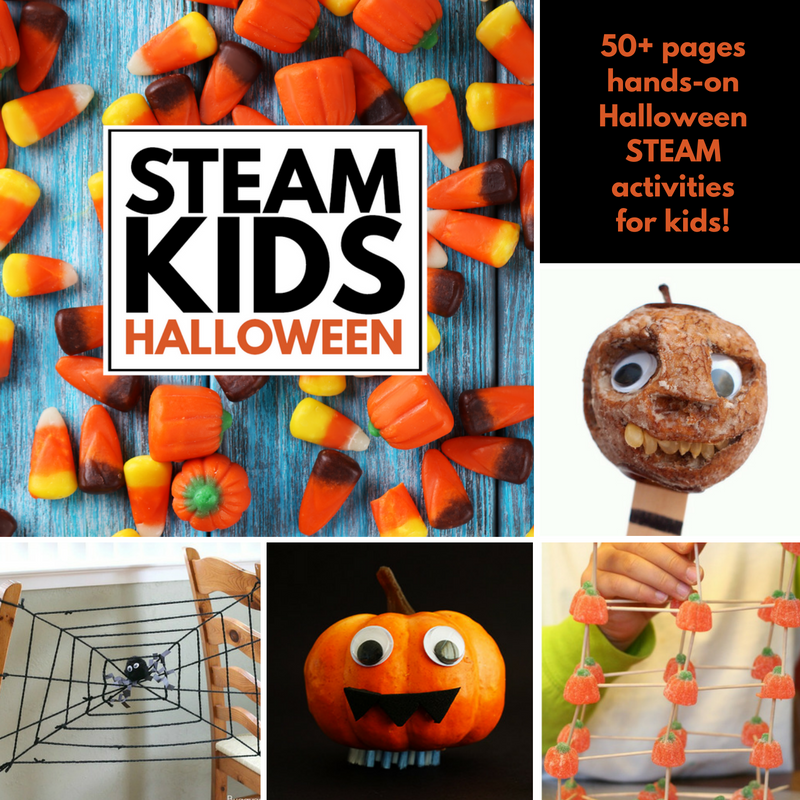 Or, you can get more fun hands-on Halloween projects here in my STEAM Kids Halloween ebook!